The Pine Hill Missionary Baptist Church was founded in the year of 1925. Rev. and Mrs. Willie Stephens from Mount Zion Baptist Church; Sister Pearlie Abercombie from Uchee Hill Baptist Church; Rev. Jake Sumbry, Brother Tom Fegans, Sister Annie Stephens and Rev. J. H. Joseph from Pleasant Grove Baptist Church. From this storefront, rented from Mr. Calvin Spencer, this Mission started and worked faithfully until Rev. Stephens purchased the lot where the church now stands. He built a small church, 20 feet by 30feet. The church was then organized by the late Rev. S. A. Harvey and named Pine Hill Baptist Church by Sis. Paralee Stephens and Brother Warren Spencer. The Rev. Willie Stephens was called to pastor. The first two candidates for baptism were Sister Jimmie Mae Washington and Sister Lula Brooks. could not carry on, Rev.J. H. Joseph was asked to serve for him. Rev. Stephens passed away December 2, 1927. Rev. Joseph carried the mission forward until 1930.
consisted of the following persons: Deacon Willie Wright, Sister Ludie Bell Lee, Sister Paralee Stephens Davis, Deacon Tom Fegan and his wife, Sister Anna Fegan, Sister Hattie Pearl Kennell and Mr. Frank Edmond. In 1945 - Sister Viola Jackson organized the Senior Choir and Sister Ludie Bell Lee organized the Usher Board. Two of the original choir members are still participating in the choir today. They are Deacon Elias Jenkins and Sister Viola Kelly. In 1951 - under the leadership of Rev. Brown the Junior Deacons Board was organized. Deacon Albert Kelly and Deacon Elias Jenkins were appointed as Junior Deacons and Deacon Albert Kelly is still serving on our present Deacons Board today. An outside baptismal pool was built in this year (1951) as well. resigned as pastor and passed away on July 21, 1960. On September 22, 1958, Rev. Robert L. Walker was called to pastor. Under his administration we continued to grow spiritually, numerically and materialistically. A new sanctuary was constructed and a lot on the north side of the church was purchased. This included our first water cooler and new pulpit furniture was purchased. The membership grew even more. Rev. Walker served nine years with the Pine Hill Family. In May 1968, Rev. F. F. Andrews was called to pastor. During this administration the church continued to grow spiritually, numerically and financially. Under his leadership we saw a new horizon with the erection of a beautiful new sanctuary in 1972. The Baptismal Pool moved from the outside in back of the church to the inside behind the choir stand. The Educational Wing was also a part of this new horizon. Rev. Andrews resigned in 1979 and moved to Dothan, Alabama. We were once again in need of a leader. April 28, 1980, Dr. William R. Roundtree, Jr., became the spiritual leader of the Pine Hill Baptist Church. The Male Choir was organized in 1980. He served until the 3rd Sunday in February 1981. God had shown him another direction in which his teaching was needed. another Shepherd over our flock - the return of Rev. F. F. Andrews. Rev. Andrews was unanimously chosen as our leader in 1983. Under his leadership great things began to happen. 1990 - A Larger Air Conditioning unit was installed to accommodate the growth of the church. Department from one musician to three: a pianist/organist, drummer and a bass guitarist. 1992 - A new copier was purchased, an additional pianist was hired to play for the Senior Choir, a beautiful flower garden and green foliage was planted on the backside and around the sides of the church. A bricked walled flowerbed with a cross imbedded in the middle on both sides was built on the front to add to the beautification of the church. Mr. Johnny Perry and Deacon Albert Kelly donated this flowerbed. 1998 - New office staff was elected, the Deaconess was organized and a new copier and computer system was purchased and the construction of a Brick Memorial Wall was started under the construction of Mr. Louis and Johnny Perry. On November 2, 1999 - Rev. F.F. Andrews, our pastor for 32 years was called home to glory, and was eulogized on Saturday, November 6, 1999 - once again leaving this membership without a leader. demolition of the old Church Fellowship Hall was begun to make way for a new structure that would be called the Fellowship and Educational Annex that would allow additional space for a day care center, offices, classrooms, conference room, a new kitchen and fellowship hall, additional restrooms, a library, a computer technology center, more storage space. October 2003 - The new building was completed and occupied. 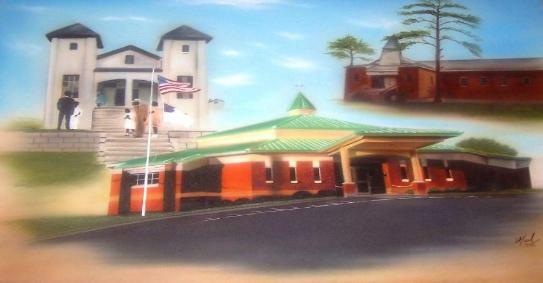 Saturday, November 1, 2003 - The members of Pine Hill held their first event in the new Fellowship Hall. This event was a pre-anniversary banquet leading up to our 78th church anniversary. Minister Freddie Primm was the keynote speaker. Sunday, November 2, 2003 - Rev. Raymond Cochran of Franchise Missionary Baptist Church dedicated the new annex to Pine Hill members, in a pre-anniversary program. Evangelism Ministry, The R.I.S.E. Tutorial Program, Hospitality Ministry, Library, Ministry, Technology Ministry, Video & Audio Ministry, Praise & Mime Team and the Drill Team. The membership roll increased by more than 200 members. May 2004 - Pine Hill hosted the Youth Rally for the Southeast District for the first time. Association, Inc., conference and banquet for the first time. The members of this great Church are experiencing a new vitality under Pastor Fryer's leadership. We are experiencing new growth spiritually and financially. As we move forward into the new millennium and the years to come, we know that God has always had His eye on this flock. By His grace and His mercy, we will continue to stand on this "solid rockâ€? as we soar in the spirit, continue to raise the standards, stay grounded and rooted in Jesus. Every year has been a great blessing for us, and we can truly testify to the fact that God is so goodand that we are a Church Committed to the Cross!